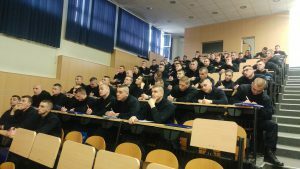 We are proud to announce a start of a module on criminal offenses based on hate crime at the Police Academy (FBiH). The training will last for two months and all cadets for the rank of policeman and for the rank of the younger inspector will pass it. The Sarajevo Open Centre successfully advocated the introduction of a 50-hour educational fund that will deal with this topic. In this generation, there are a total of 200 cadets.